For Vishnu Viswanath, 29, and Meenakshi Moorthy, 30, Silicon Valley techies, “daredevilry” may have been the cause of their deaths. Their bodies were found at the bottom of a 3,000 foot drop off Taft Point in Yosemite National Park, according to a San Francisco Chronicle news report Oct. 29. The couple were doing what they loved to do, going by their entries on a blog site chronicling their adventures and experiences during their travels. Their bodies were found by Rangers Oct. 25, after tourists spotted them, spokesman Jamie Richards is quoted telling SFChronicle. Friends told SFChronicle that Viswanath had just taken a job with Cisco Systems Inc., in San Jose, and that the two were driving from New York to Silicon Valley, making it like a sight-seeing tour. 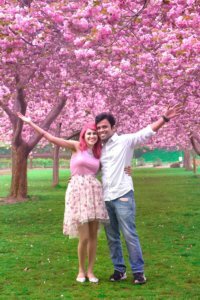 The blogsite, holidaysandhappilyeverafters.com, has beautiful pictures of the couple in various locations, including in a hot-air balloon, with Moorthy sporting pink hair. The headings of some of the entries shows a happy couple enjoying life — A Renewed Yay-Saying Beginning. Summer Roadtrips in USA for this year (ending with a huuuge travel hangover! ); Niagara Falls on my Birthday plus tips for an epic trip to the Mighty Falls. ; Lessons Learnt from my Man in 7 years of love and 2 years of marriage; Road Trip from Chicago to NYC, from dreamy lighthouses to haunted covered bridges! According to authorities, the investigation to determine the exact cause of death will take several weeks, SFChronicle reported.